Bubble Tape by Hubba Bubba has been around for several decades now. And when an established candy that’s this tasty goes all out for a holiday such as Easter, we tend to pay attention. Bubble Tape, or any bubble gum, may not have been your first thought when it came to Easter candy varieties you’d like to see in your candy basket this year, but we’re going to tell you all about this retro Easter candy in the hopes that you’ll decide to try something a little different this season! As you probably know, Bubble Tape features long spools of sugary bubble gum, all wound up in fun plastic discs. For Easter, Bubble Tape has gone the way of the SweeTart and decked itself out in blue, yellow, and pink discs, which are sure to get you in the mood for Easter and springtime in general. You get four of each disc color in each bulk box for a total of 12 rolls. Each one is flavored in awesome original flavoring. If you’re looking to add the most vibrant colors to someone’s Easter baskets this year, throw in one of each of these Bubble Tape spools. The yellow, blue, and pink are sure to brighten up anyone’s Easter. And the sugary bubble gum is just too much to handle sometimes. You’ll always be just itching to start chewing some more. 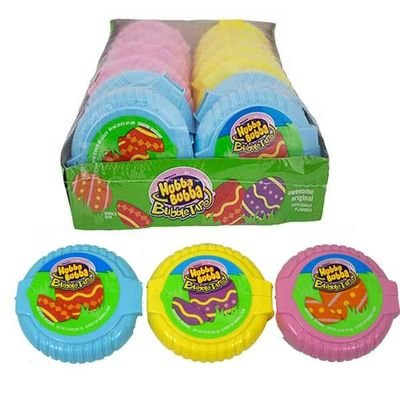 Shop for Easter Bubble Tape and all retro Easter candy now at BlairCandy.com!